All St. John’s children are encouraged to take pride in their own appearance whilst valuing their own property and that of others. We want our children to have a sense of community and security and for these reasons, we have a school uniform, including a P.E. kit. The school logo incorporates our mission statement and motto – “Learn to Love and Love to Learn” which we refer to most days. This being the case we like the children to wear uniform with the logo. Girls may wear either: a greyskirt, skort or trousers with white, grey or black socks or tights. Most girls wear white socks and grey tights.Boys can wear greytrousers with grey or black socks. Your child will be expected to wear sensible black shoes – trainers and ankle-boots are not permitted. As the weather warms up, girls are able to wear a pink and white gingham dress with white socks and boys are able to wear grey shorts. We like the children to remain in sensible black shoes in the summer months too (no sandals please). This is to be kept in a maroon P.E. bag. Children have an indoor and outdoor session of P.E. each week but they will need their P.E. kits in school every day.P.E. kits can be taken home on Fridays to be washed and then returned on Monday. 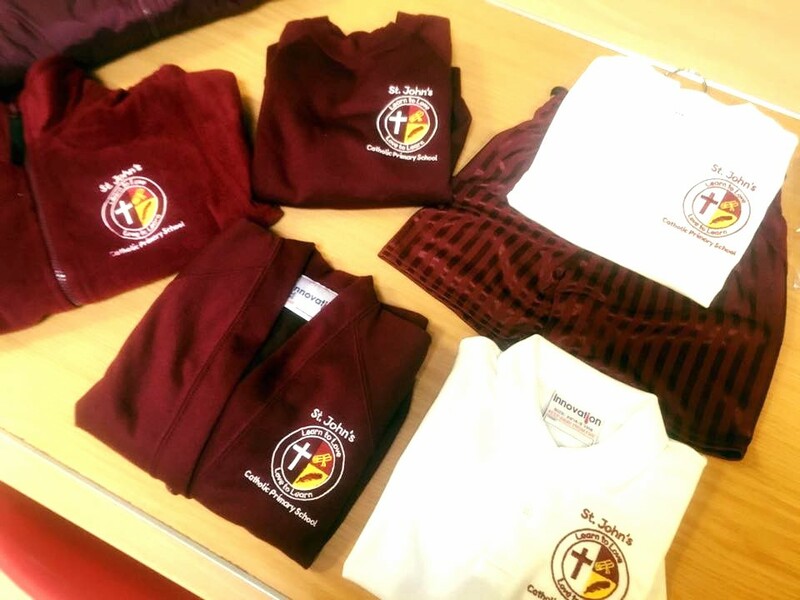 (Children will be encouraged to change back into school uniform after a PE lesson before leaving school to ensure PE kits remain in school). Maroon jogging bottoms and P.E. hoodie. Your child is able to wear a watch and a pair of small stud earrings, if their ears are pierced. Please discourage your child from wearing jewellery in school as it can cause unpleasant injuries and can be easily lost. There are West Sussex County Council regulations which prohibit the wearing of any kind of earrings, ear studs, watches, rings, neck chains, bangles etc. during PE lessons or other organised physical activities. The only exceptions to these regulations might be the wearing of religious or cultural jewellery (when the County Adviser for PE should be consulted) or when it is justified on medical grounds e.g. when a pupil has only recently had an ear pierced in which case plaster tape may be used to protect the ear. Children are allowed to wear watches, but these must not be Smart watches e.g. Apple. They are not permitted to wear fit-bits. This is because these devices are able to take photographs and videos and compromises the safety of your child and others. Hair that is shoulder length or longer must be tied back and remain tied back for the whole school day. Please check your child’s hair regularly for head lice so that we are able to avoid class infestations. Thank you for your support in this matter. Hair accessories are fine. Burgundy bows are regularly worn by children in school. Hair bands that are multi-coloured, in the shape of animal’s ears or are too big are not allowed. Children are not allowed to wear either make-up or nail varnish to school. It is vital that everything your child brings into school is named with a permanent marker or name label. It is surprising how often children will leave things lying around. If you have labelled ALL their items, then we can ensure that they are reunited with their owners quickly. At St. John’s we believe that outdoor learning is a vital part of a child’s school experience. 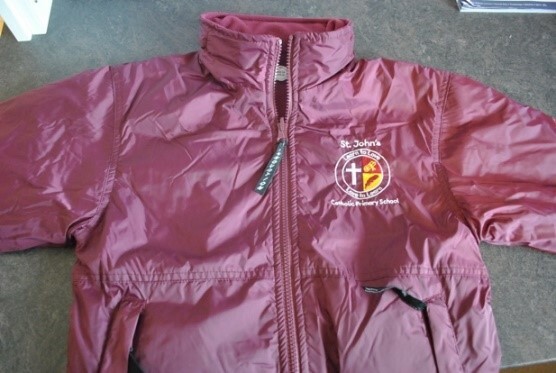 Taylormade sells reversible jackets and fleeces for you to purchase for your children – the staff all have one of the reversible jackets and they are wonderful. We really recommend that children get them. 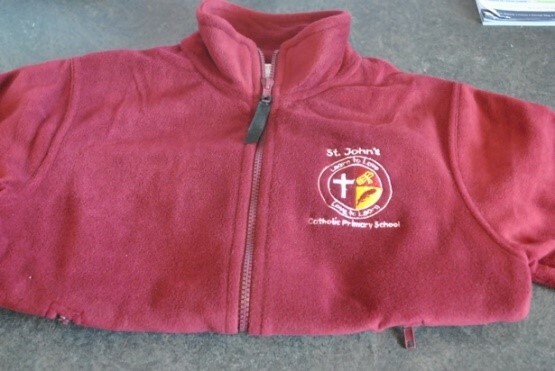 These are not compulsory items of uniform, but are a great addition to your child’s school wardrobe and stops the need for winter-coat shopping. We will ask children to bring in wellington boots and a light-weight waterproof coat into school at all times. 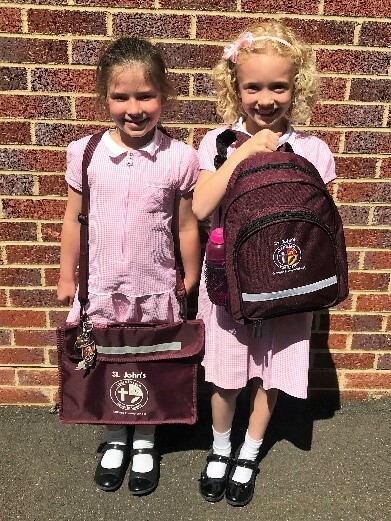 Every child needs a book bag (Reception) or rucksack (Year 1-6). In this they will carry their letters, reading diary, books and homework. Taylor Made Uniforms sell a deluxe book bag which is a heavy duty book bag with shoulder strap. 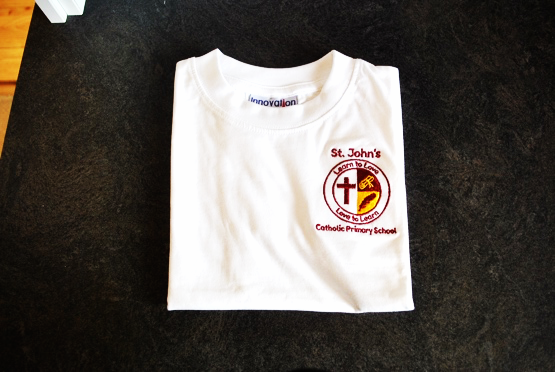 We chose this for our children as it is durable and will hopefully last them for the whole of their time at St. John’s. It is slightly more expensive than a usual book bag but we think it is really worth it – and so do our children. Whilst we do not insist on children having a St. John’s rucksack we would really like them to. We chose this rucksack as it isn’t too big (but is big enough), has a water-bottle holder and has little standing feet! Mrs Bono loves the new rucksack and is hoping lots of children choose to get it this year!! Choose the option of “Collection” or “Free Delivery in Horsham” (orders over £12.50) Once your order is ready – you will receive a confirmation email. If you are unsure of sizing and would like a Free fitting, please call Taylormade on the number below to arrange an appointment. Please note: After the second week of August they cannot guarantee stock levels, therefore, please order as soon as possible.